Once, when I was younger, I rented a Sega Genesis console for a week just to play Road Rash. I was never particularly good at it, but there was something about rocketing down the highway on two wheels, blowing past oncoming traffic at a thousand miles an hour and clubbing my fellow riders into next week that I just could not get enough of. So when Road Redemption turned up on Kickstarter last year, you better believe I was excited. A new alpha version released yesterday looks like a big step toward the big finish. The update adds a split-screen mode for two to four players, full support for mouse and keyboard as well as gamepads, a new HUD, new weapons, enemies, "snowy forest" levels, Takedown and Survival mission types, deflect and disarm moves and a whole bunch of other stuff. The update also comes with a new gameplay trailer that looks very much like the game I remember so fondly. 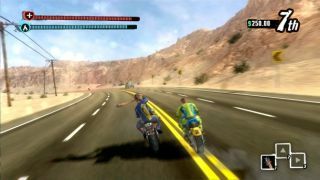 The bike animations are still a bit stiff and floaty, but it sure looks like Road Rash – a much bloodier, more graphic and crash-bang-boomier Road Rash, perhaps, but there's no mistaking the heritage. I still laugh like an idiot whenever a rider runs headlong into an oncoming car and launches himself into orbit, too. You just can't beat classic comedy. Access to the Road Redemption alpha can be had now for $34, or $70 for the special edition. The full release is expected to be ready to ride near the end of this year.